Here, the total power generation from every power plant source is the top of the load curve, with each colour indicating a source of power generation. This is also similar to the total power consumption, which is slightly lower after minor grid losses are taken into account. The dark grey colour is for the black coal fired power generation. The yellowish colour is for the brown coal fired power generation. The purple colour is for natural gas fired power generation. The blue colour is for Hydro (water) power generation. The green colour is for wind power generation. The red colour in the dip between the two peaks is for solar power plant generation. The other colours mixed in with the rest of them are from those smaller Other sources. Rooftop solar power is not included on this graph, as this shows just the power generation from all power plants only. Here, the upper black line is the total from all fossil fuels, and this is the same as for all three colours, the grey, dark yellow and purple colours combined in the image directly above. The black line just under that top black line is the Sub Total just for coal fired power, and that is the same as the combined colours of the grey and ark yellow on the image above. Note here how closely that coal fired line follows the shape of the upper Load Curve, and this indicates that coal fired power can be ramped up and down to follow actual power consumption. This Image shows just the gap between total power generation from every source and the total power from the three renewable sources only. 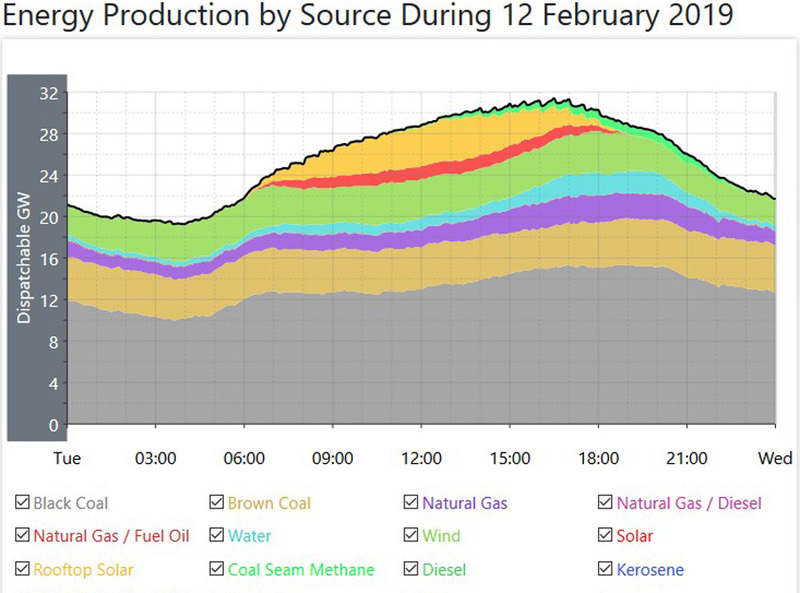 It is the same image as the first image at the top here, only with the fossil fuelled total (the grey, yellow and purple colours) and those smaller Other sources removed from the graph, As in that top image, it shows Hydro Power, (blue colour) wind power, (green colour) and solar power. (red colour) This image is used here to highlight the gap between the total power generation (that black line, which also includes RTS as well) and the total from renewable sources alone. This image shows the power being generated from the smaller sources other than the major sources of power generation. These include Natural Gas/Diesel, Natural gas/Fuel Oil, Coal Seam Methane, Diesel, Kerosene, Waste Coal Mine Gas and Bagasse. All of these are fossil Fuels, excepting Bagasse which is sugar cane waste mostly used to provide main and auxilliary power at sugar mills. This image shows all Hydro power generation. It is the same as the blue colour in the top image for power generation from all sources. This image shows the total power generated by every wind plant in this vast coverage area. It is the same as for the green coloured line in the image at the top showing generation from all sources. While the total Nameplate changes often, the latest information is that the total is now 8000MW and higher, and that is a large total. However, that total equates to almost 2 Million homes with panels on their roof. That equates to an average sized installation of 4.3KW. Most of the power is consumed by the homes with the panels, and what is fed back to the grid is only consumed in the local residential areas. While seemingly still high this total is spread across that huge number of installations across the whole of this coverage area. This image shows the total power generated from all the wind plants, and all the solar power plants in this coverage area, combined in the one image, and compares it to the overall total generated power, the black line at the top of the graph, which also includes RTS as well. Wind power is the green coloured area, and solar plant power is the red coloured area, and these are the same as shown in those other coloured images at the top of the Post. I have also added the data below for the total generated power for both wind and solar plant power combined, and the percentage of the overall total below for the maximum power from both sources with respect to the overall total, both at the maximum for both, and then for the total for both at the daily peak Power time. This image shows the overall total generated power with Rooftop Solar Power (RTS) added to the total from all of the power plants. 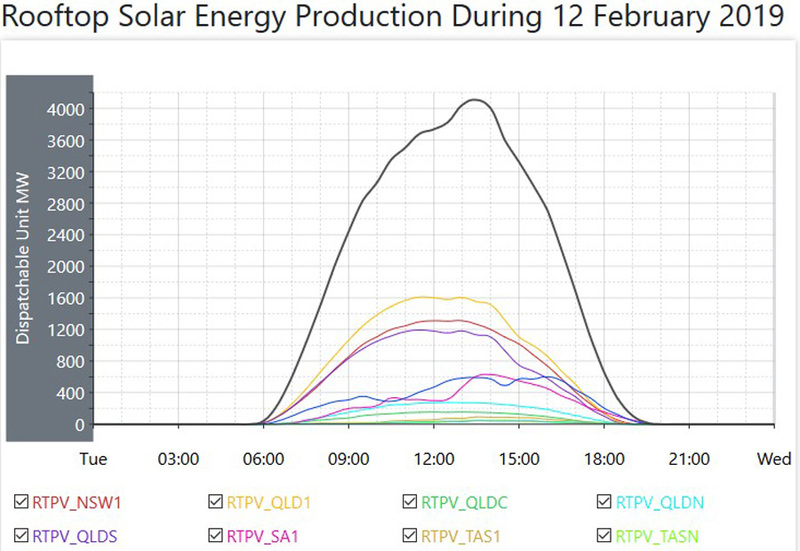 RTS is shown here as that orange colour added near the top of the graph in the middle, during daylight hours, and is indicated on the legend below the graph as Rooftop PV (PhotoVoltaics). The new overall total is that black line along the top of the Load Curve. 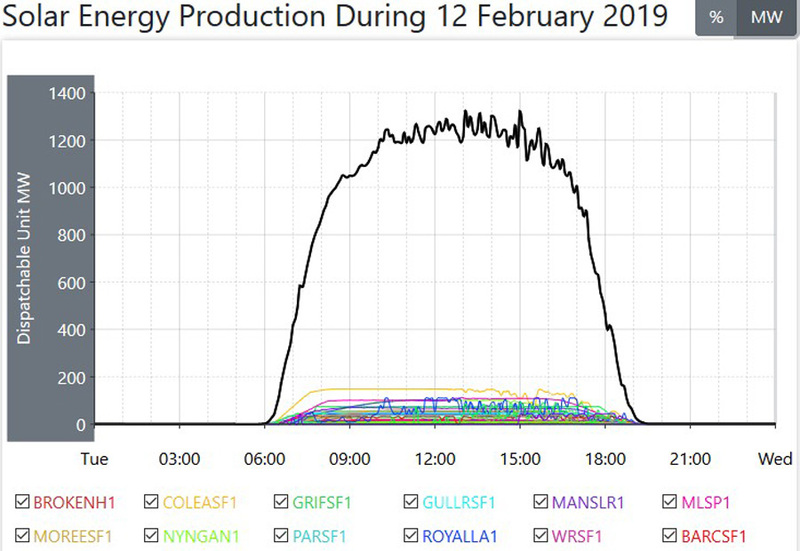 Note here that with this RTS total added, the shape of the full load curve, the black line now looks almost exactly as Summer load curves used to look prior to the advent of RTS, and all those panels on roofs of private dwellings. 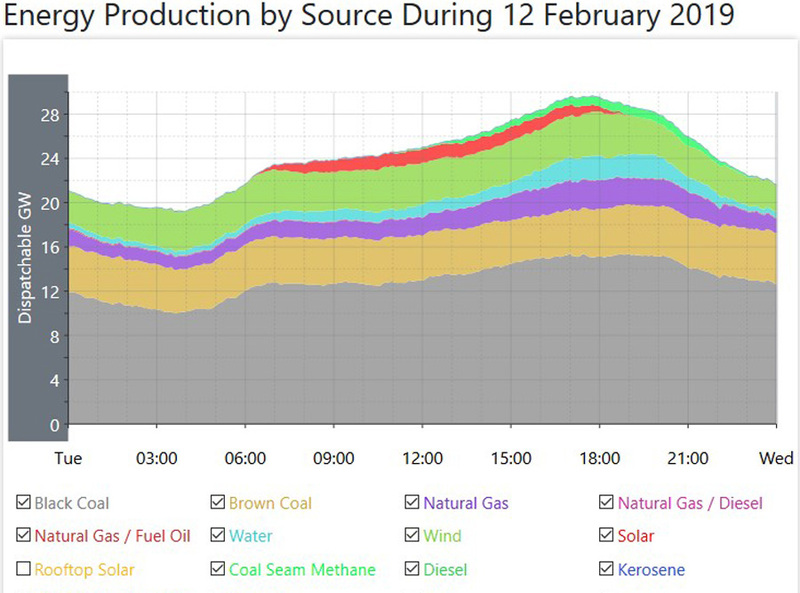 Overall power consumption rose on this day, and power generation covered that rise. The minimum power generation (the Base Load) was 1000MW higher, and here, while it is usually at just the one point in time, on this day, it was the same total, 19300MW for almost half an hour. 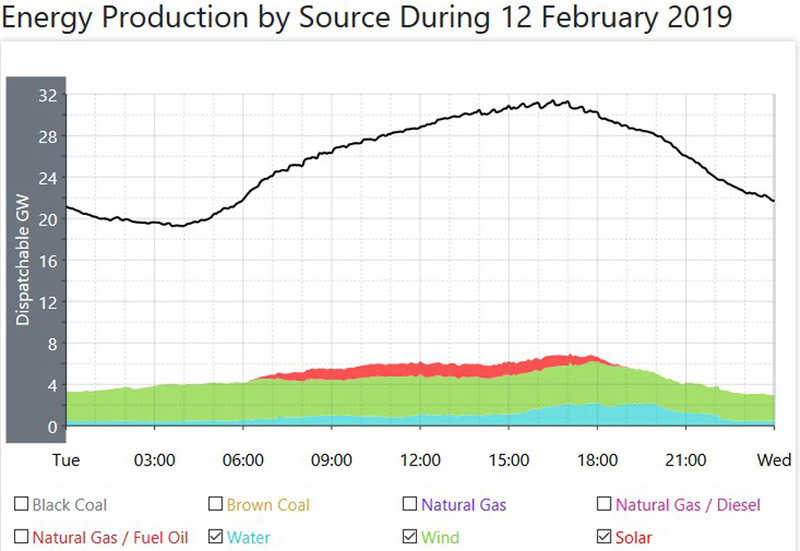 The peak at around 5PM was 1100MW higher, and that rise mostly covers the three big States, (South Australia and Tasmania, the two lowest consumption States, only make up a little more than ten percent of the Australian total power consumption) and in those three big States, the total power consumption at that Peak varied somewhat. 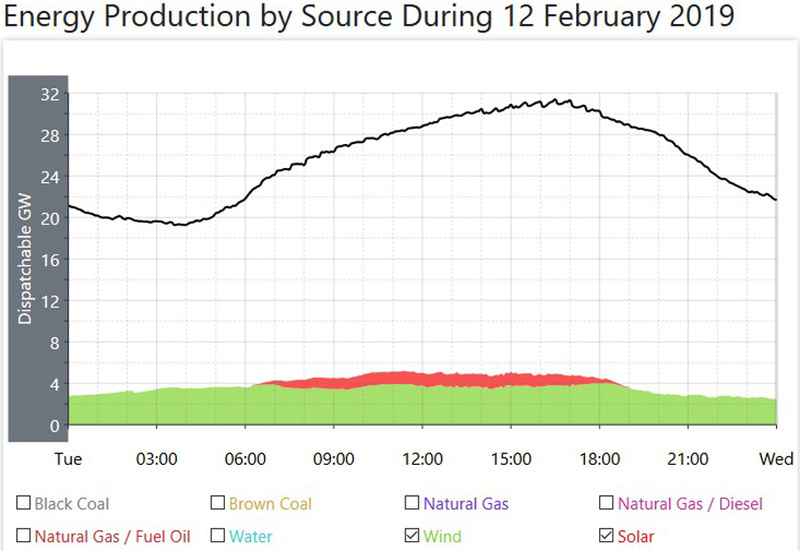 In New South Wales, the peak was 2000MW higher than for the day before. 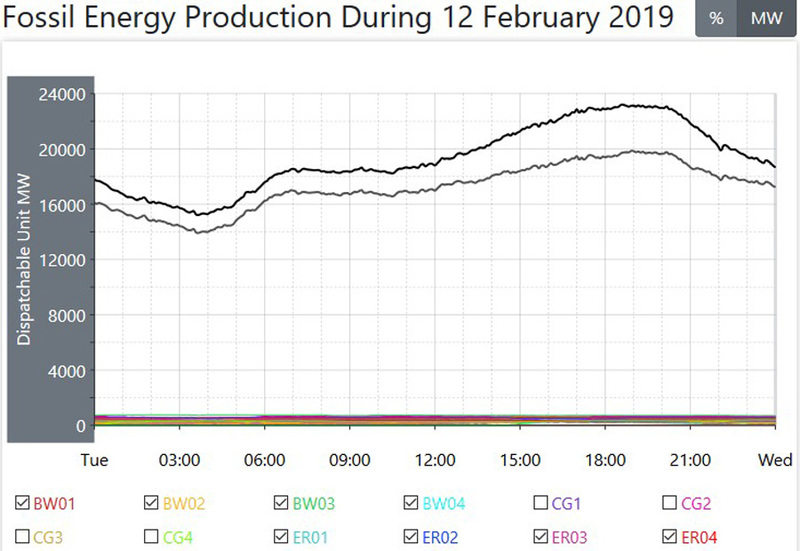 In Queensland it was 700MW higher than for the day before, and in Victoria, it was 600MW lower than for the day before. Overall that total power consumption across this AEMO coverage area was 28600MW at that 5.05PM point in time, and the total power generation from all power plants at that same time was 29700MW. 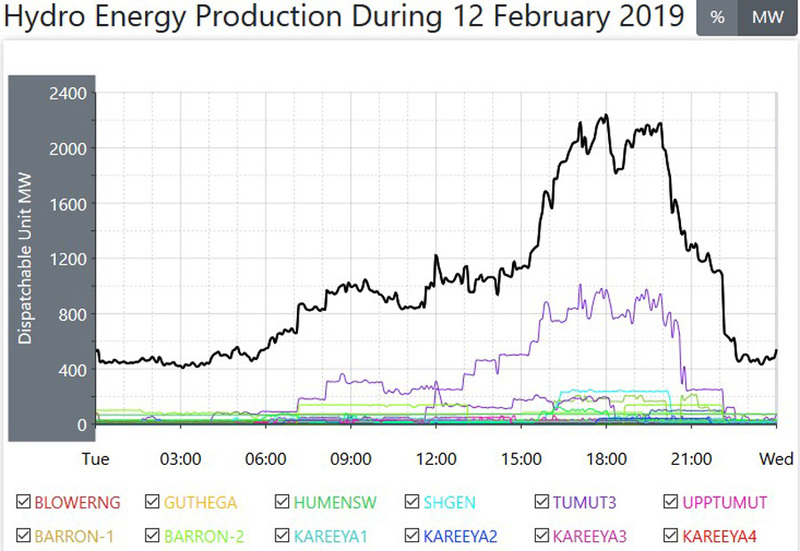 The average for coal fired power was higher by just 90MW to an hourly average of 17190W, and the range between the low for the day and the high was a substantial 5930MW. 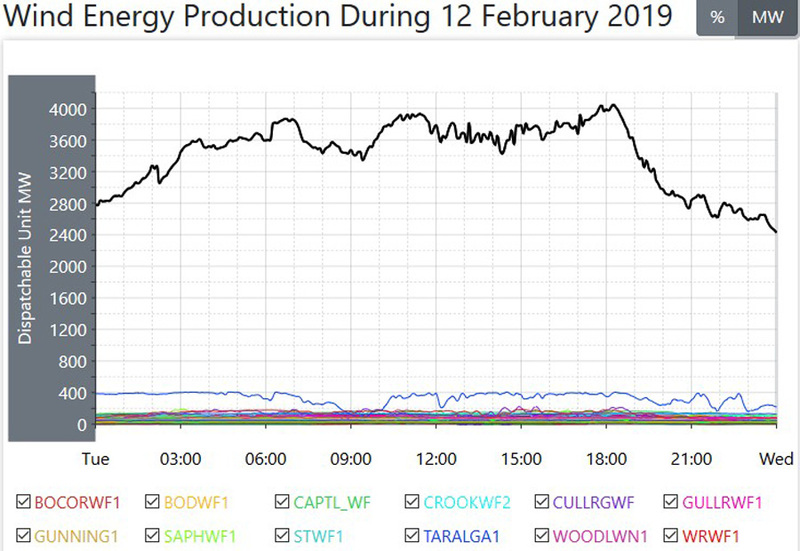 In Victoria, the only Unit off line, at the Loy Yang A plant, Unit 2, came back on line at 2.30PM, and by 4.30PM it was close to its maximum power output. In New South Wales, Unit 1 at the Eraring plant came back on line at 5PM, and was back close to full power by Midnight. Just prior to Midnight, and at that same plant, Unit 2 went off line, slowly falling as the end of the day approached. In Queensland, the single Unit at the Tarong North plant came back on line at Midnight as the day began, and was back at full power delivery by 1AM. There are now just three of those coal fired Units off line in this vast AEMO coverage area. The average for natural gas fired power was down by 330MW, and the average from those smaller Other sources was also lower, down by 60MW, and the average for solar plant power was also lower by 60MW. 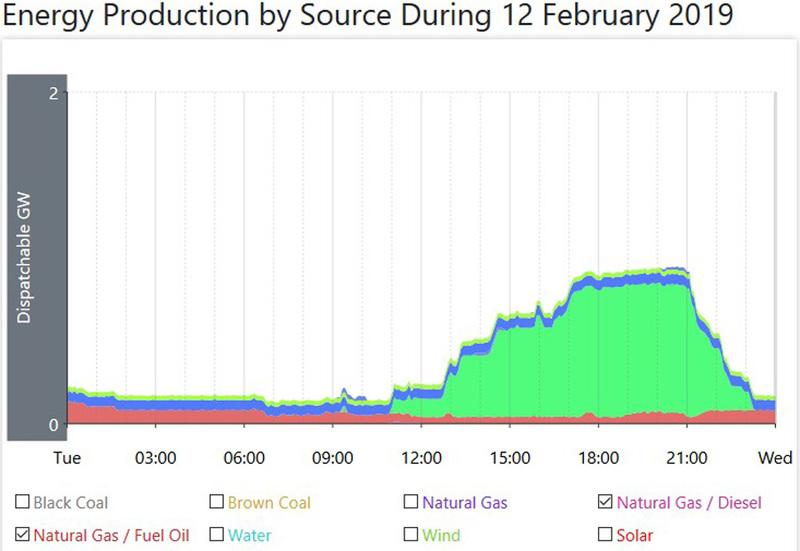 The average for hydro power was up by 90MW, and note from the hydro graph the upper purple line indicating the pumped hydro plant at Tumut Three, and how it was delivering a lot of power for a number of hours across the afternoon and into the early evening. Wind power had a huge day really, up to an average of 3390MW, a rise of 1370MW over the day before. That average gave wind power a daily operational Capacity factor of 59.88%, almost double the year round average. However, note here that on a day when wind power was higher than it has been for a long time, that average for coal fired power also rose as well, again confirming that what happens with wind power has no effect at all on what is being delivered from coal fired power. 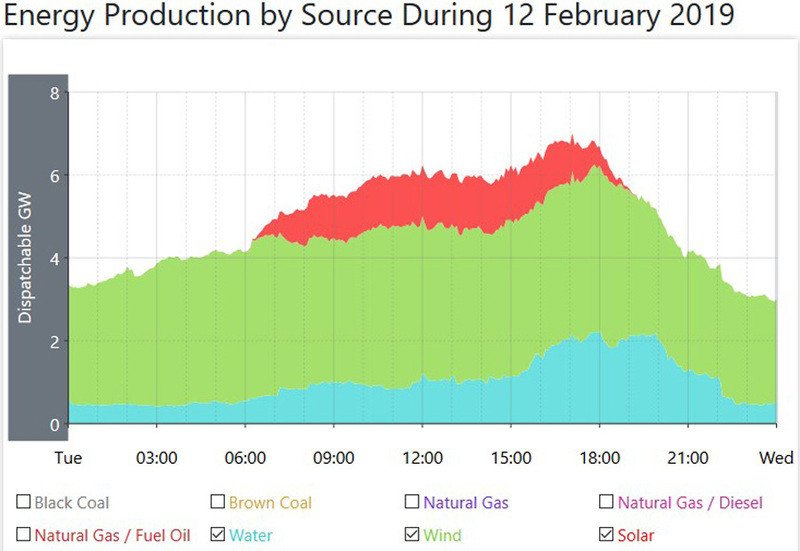 With that overall average so high, and coal fired power also rising, albeit by a much smaller amount, coal fired power still delivered almost 70% of all that required power.